I’m a big believer that you lay the foundations for thinking at an early age. My daughter’s in a preschool that invites parents to teach classes, so rather than whining about the lack of science education, I thought I’d do something about it. Yesterday I ran the second science lesson I’ve taught there. It was fun, and I learned a lot in the process. Choosing a topic for teaching isn’t hard. You need to think back to Newton: what was it that made him ask about gravity? The proverbial apple was just an apple until it became a demonstration of gravity; similarly, kids are pattern-assimilating creatures, and they take stuff for granted all the time. So just make them think differently about stuff that’s right under their noses. My first lesson was on electromagnetism. That sounds complicated for a three-year-old, until you go to a party and see their hair standing on end thanks to balloons, or watch them catching metal fish with magnets tied to poles. Then you realize that it’s all about asking the right questions. So the first thing I realized was: pick something fundamental. Heat. Air. Magnetism. Dillution. Start with that. The second problem is making them understand what’s going on. You can’t reason with a three-year-old, as most parents negotiating Hallowe’en candy are discovering. But you can provide a bunch of concrete examples that allude to something. By offering a series of concrete proofs that something is there. The third big lesson is that it has to be fun, and experiential. Kids won’t sit still for more than a couple of minutes at this age, so they need something to do. 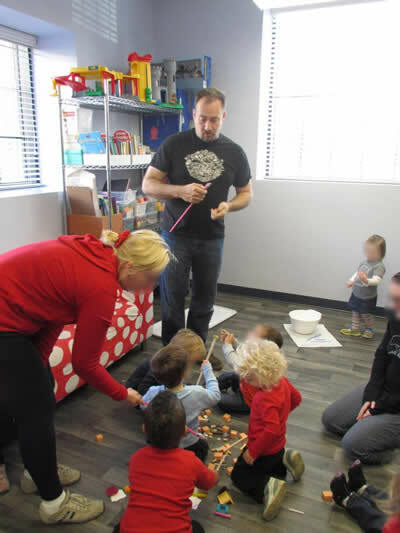 To teach magnetism, I made each kid a magnetic “wand” and dumped a pile of things—some metal, some not—in the middle of the room. They had to sort things into two buckets based on whether or not their wand picked things up. After five minutes of noise and chaos, the kids sat, breathless, and I asked them to tell me what was different about the things in the two buckets. “They’re all metal!” screamed one of them. I put a paperclip on a balloon, and had the kids try to cross the room with the paperclip attached to the magnetic wand; to accomplish this, they had to move smoothly. 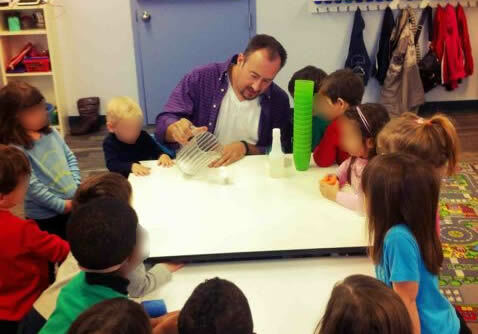 I had a weak and a strong magnet, and had a teacher hold a cup suspended from each. The kids waited with bated breath as I added weights to each cup until one came crashing down. I rubbed balloons and stuck them to the roof with static electricity. With science, every day is a bad hair day. I rubbed a balloon and held it near an empty aluminum can. Turns out this makes the can roll away, which looks like magic. I used opposing magnets to push two toy train cars away from one another. Again, magic. None of the kids know what magnetism is. But they do know that there are unseen forces that can attract or repel, and somehow metal is involved. Once you’ve given them evidence (the difference between the two buckets) get them to come up with the answers. Better yet, ask them to devise a hypothesis—what do you expect to happen?—and then try to confirm or repudiate that hypothesis. This is key. They won’t know they don’t know something if they aren’t asked. I plugged in a small household fan, and pointed it at them. I asked them to explain what wind was. They couldn’t but they tried. One of them said, “air!” and I seized on that to explain that wind was air moving around. Then I said, “what is air?” They had a hard time answering that, so I got them to breathe in and out for me, feeling the air going into their lungs. I could have had them hold their breath, to realize that they needed air, too. I held some ribbons in front of the fan, and they saw them stream out. “See what happens when the air pushes against the ribbons?” I asked, showing them the flow through the fan and out the front. Then I held up an Airzooka. If you haven’t heard of these, they’re basically a big plastic cylinder, covered at one end with a bag tied to an elastic. You aim the Airzooka at something, pull and release, and a bolus of air travels across the room. I first used it to make some ribbons on the far side of the room move; then I went after the teachers. Finally, I asked each kid if they wanted to feel it (most did.) Giggles ensued. Next, I divided the class into tables of four kids and one teacher. Each table got a cheap hair drier ($14.99 at the local drugstore) and a couple of colorful propellers on sticks. The teacher turned on the hair drier, and the kids made the propellers spin. Then each kid got a ping pong ball. Putting these in the airstream of an upheld hair drier makes them float, as if by magic, thanks to the Bernoulli principle; I think the teachers were just as amazed as the kids. They took turns putting them in the stream, grabbing them, and seeing how many balls could float at once. 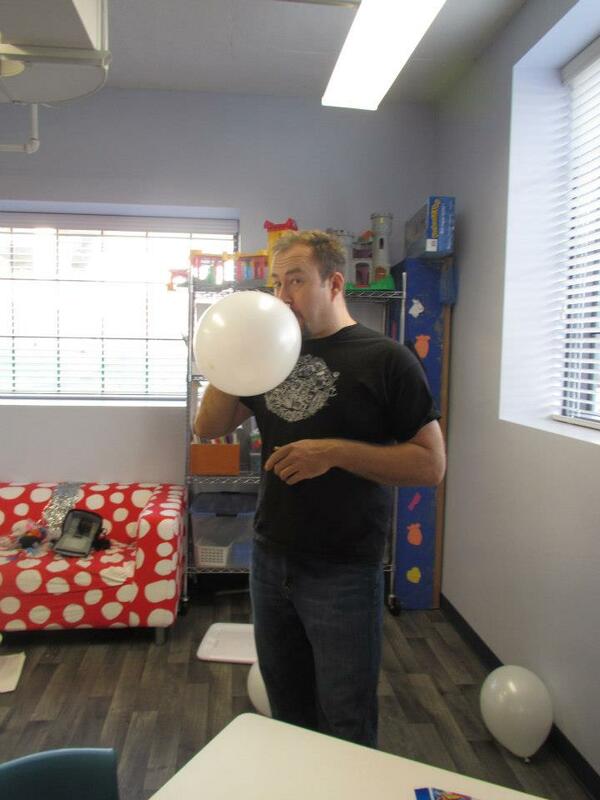 I inflated a long balloon—the kind used for making balloon animals—and pumped it up, then released it. It flew across the room to cheers of delight as I explained that the air I had put in was now being released. Then I switched tacks, and held up two items—a slice of a foam pool noodle and a toy car. I asked the kids which would fall fastest, and they correctly said, “the car,” which I then showed. Then I pulled a second slice of foam noodle out of my back, to which I’d attached a small parachute made from four pieces of string and a plastic bag. Dropping them both, the parachuted noodle fell gently to earth. I then issued each kid a parachute (yes, this meant my wife and I spent an evening tying parachutes.) The teachers tied a noodle to each parachute, and I had them wave their arms, feeling the resistance. We then had some more madness as they threw the parachutes in the air and watched them float to the ground. 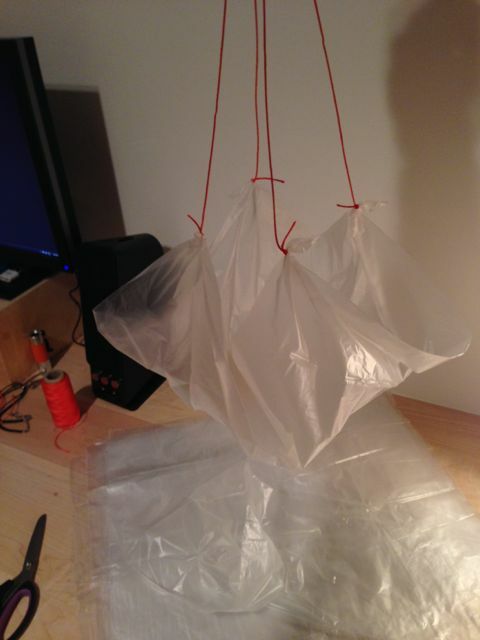 You can make a simple parachute from a square of light plastic bag and 4 strings. After this, I had the kids gather around for two final demonstrations. First, I lit a candle and explained to them that fire needs heat, oxygen, and fuel to burn, and that the heat came from my lighter, the fuel from the wax, and the oxygen from the air. Then I said I was going to make a different gas, called Carbon Dioxide, that was heavier than oxygen and would put the candle out. In a transparent pitcher I mixed some sodium bicarbonate and vinegar, and they watched it foam up. I slowly poured the gas in the pitcher over the flame, and it went out. I didn’t think this would be a big hit, but they all screamed, “DO IT AGAIN!” and I had to repeat it a few times. Pouring CO2 on a lit candle was a surprising crowd-pleaser. Finally, I got out a Sodastream carbonator. I poured them each a glass of still water and had them drink, thinking about how it felt on their tongues. Then I showed them the canister and explained that it had gas in it, and carbonated the water (which makes a satisfyingly gassy sound.) I poured them some—again, most of them wanted to try it—and they saw the bubbles and felt them on their tongues. I don’t think the kids are about to formulate Boyle’s Law of Partial Pressure. But I do hope that some of them realized, by seeing bubbles and snuffed candles and flying ribbons and dropped parachutes, that air is a thing. Anyway, I wrote this down mostly for my own reference, but I figured I’d publish it here. If anyone has other examples of good lessons around a particular theme I’d love to hear them. Sounds like a great class! You thought of some great examples to explain those two ideas, which would normally be very complicated for a three year old to grasp. This is awesome Alistair. I like that you are doing everyday, concrete things with them that reinforce the bigger picture ideas they’ll need to live a life of consequence. Asking good questions and thinking about connections, (or as Lauren Bacon calls it, being Curious for a Living) is a huge determiner of success.